Agilent Technologies has introduced the N9923A FieldFox RF Vector Network Analyser (VNA). The FieldFox RF VNA provides measurement stability of 0.01 dB/degree Celsius, and offers integrated QuickCal calibration capability. QuickCal enables consistent measurement results and confidence in the data while eliminating the need to carry a calibration kit into the field. 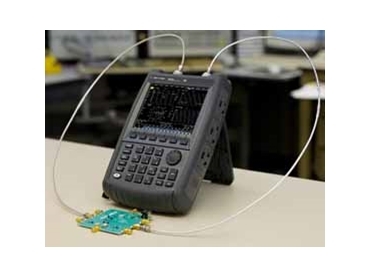 The FieldFox RF VNA expands Agilent's handheld instrument portfolio and is designed for field engineers working in aerospace, defense and network equipment manufacturing, who characterize or troubleshoot RF components for mission-critical communication systems. As a full 2-port network analyser, the FieldFox RF VNA allows operators to simultaneously measure and display all four S-parameters. The FieldFox RF VNA is for engineers requiring more network analysis functionality than the flagship Agilent N9912A FieldFox RF analyser. The Agilent FieldFox family of analysers set a high standard for ease-of-use, ruggedness and portability It weighs less than 2.8kgs. With any vector network analyser, calibration is a critical component. Traditional VNA calibration can be a headache, especially in a field environment. Traditional cals require cal kits and hardware accessories that not only need to be carried into the field, but also maintained. The FieldFox RF VNA addresses these frustrations head-on with QuickCal, a built-in calibration capability. Users can calibrate the FieldFox RF VNA without an external cal kit and without mechanical standards. With QuickCal, operators can perform a calibration in seconds, providing a quick and easy way to eliminate measurement errors. Another challenge with many handheld instruments is the equipment's own drift over temperature. While this is not a major issue in a temperature-controlled office environment, it is a problem outdoors, where large temperature variations are prevalent. The FieldFox RF VNA has a stability specification of 0.01 dB/degrees Celsius. As a result, drift errors due to the test equipment itself are very low. The FieldFox RF VNA is a rugged, weather-resistant handheld RF VNA. The FieldFox RF VNA offers a field-proof design with no fans or vents and meets and exceeds MIL PRF 28800F Class 2 compliance. Moreover, the FieldFox RF VNA is easy to use with a task-driven user interface that helps guide users smoothly through measurements.